For privacy and confidentiality reasons, you have the option of protecting real user names that are shown in the reports. This is applicable to all Email and Web Security reports, logs and also entries in the Incidents page. In addition, it applies to exported and scheduled reports. When this option is enabled the reports display pseudonames instead of real user names. To see real user names, you need to have the Privacy Guardian permissions. In the Settings page>Account tab>scroll down to Privacy Guardian, and slide to ON, and click Save. The real user names are hidden in the reports. By default, you are granted Privacy Guardian permission and this enables you to see real user names in the reports. When an Administrator has access to real names, this symbol is displayed next to the Administrators name in the Administrators widget in the Admin Permissions column. All other admins who do not have the Privacy guardian permissions will see pseudonames. Permission can be granted only by an administrator who is a System Operator and a Privacy Guardian. 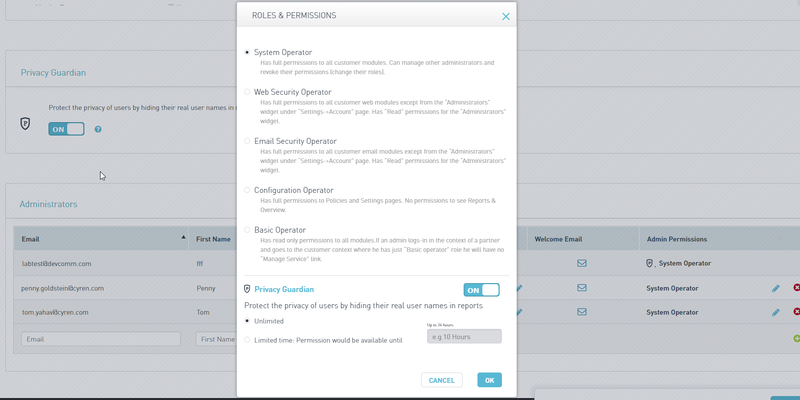 Before you grant Privacy Guardian permissions to other administrator's, you must enable the Privacy Guardian setting to ON in the Settings page>Account tab. Scroll down to the Administrators widget, and in the Admin Permissions column, click the pencil icon next to the Administrator that you want to grant permission to see the real user name. The Roles & Permissions window is displayed. Enable Privacy Guardian by sliding to ON. Unlimited: The administrator has an indefinite period of time to view real usernames in the reports. Temporary permission can be granted for 1-24 hours, once the permission time has expired then the admin will see psuedonymized usernames again. When hovering over the the tooltip displays how much time is left until the permission is revoked.